This is a second part of my Spring Solstice Wrap crochet pattern. If it’s the first time you hear about my new crochet shawl, please, check general informations and instructions for Part 1 HERE. 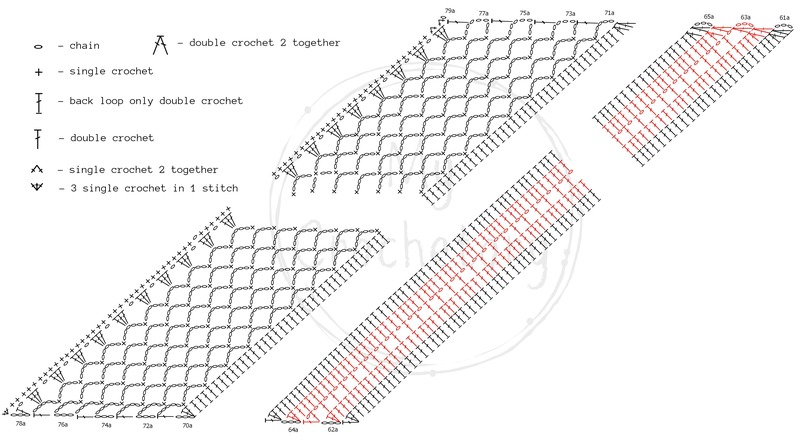 Scroll down for both free pattern instruction for Rows 34a – 79a and crochet charts. Look again at the picture below which should give you an idea of the shawl’s construction. Last week I released instructions for Rows 1-33 and today we will enlarge the main triangle (A) for the first half of the finished trapezoid (B). You will find the free crochet pattern below, but you can also purchase the ad-free printable PDF version of the whole pattern from my ETSY shop HERE or Ravelry HERE. dc2tog – double crochet 2 stitches together – [yarn over, insert hook in indicated stitch, yarn over, draw up a loop, yarn over, pull through 2 loops] twice, yarn over, pull through all 3 loops on hook. BLdc2tog – back loop double crochet 2 stitches together – the same as dc2tog but working in the back loop of indicated stitches. CLICK HERE for Part 1, Rows 1-33. Continue working after Row 33 with the same yarn. Row 65a: ch3 (does not count as a dc), dc2tog 2 in first 4 st(s), dc in every st(s) across row until last st, 3dc in last st. Turn. Row 71a: [ch5, skip 3 st(s), sc in next st] – repeat across row until 2 st(s) remain, ch5, dc in last st. Turn. Row 78a: ch3 (counts as a dc), dc in first st, ch1, 3dc in first ch-5 space, [ch1, 3dc in next ch-5 space] – repeat across row until last ch-5 space remain, dc in 3rd chain of 5th at beginning of previous. Turn. Row 79a: ch1, sc2tog 2 in first 4 st(s), sc in every st(s) and ch-1 spaces across row until last st, 3sc in last st.
Fasten off yarn and weave all ends. Next week I will release final instruction (available here) for the second half of the wrap. Don’t forget to Pin it to save it for later!